We woke up in Summerstrand to a beautiful sunny morning. The little beach town we had found in darkness was absolutely stunning during the day. Everything is situated right along the water on one long street called Beachfront. 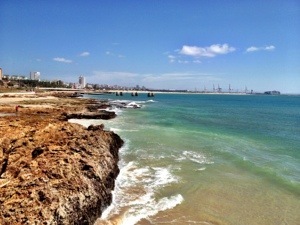 On the other side of the road is stretches of white sand beaches, lots of surfers, boardwalks and blue ocean. 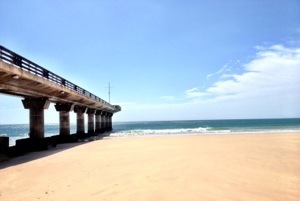 We drove in to Port Elizabeth hoping to see some sights before continuing onwards to Jeffrey’s Bay. Now, perhaps it was the area we found, or the fact that we had gone from beach town to busy city immediately, but Port Elizabeth was not our style. Right away we could see why people had told us not to go there at night. The city was sketchy enough in the light of day! Lots of back alleys and one way streets to get lost in, and without a city map we were definitely lost. 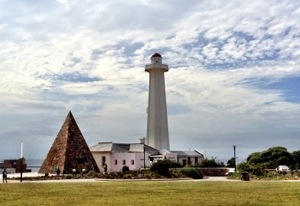 We tried to search out the city’s lighthouse, which was apparently the touristic feature of the area. After driving in circles for over a half hour, we finally stumbled across it just as we were giving up. It was on top of a hill, and nowhere NEAR the water. Seemed like an odd location for a lighthouse. The thing was very cute, with tiled mosaic artwork next to it, and a little park to relax in. The building had a little cafe in it as well, and the barista made us lattes as we climbed the tower to the viewpoint. 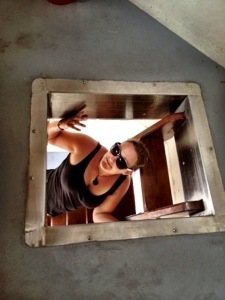 The light house was tight to climb. Steep stairs at first, then ladders after that. The place just kept going and going and going! When we finally reached the top, it was very windy. You could see a whole 360 degree view, but it wasn’t stunning to look at. The ships in the harbor, the downtown core, then off to the right you could spot the beginnings of Summerstrand. We decided we preferred beach towns to big cities, so we climbed back down, grabbed our lattes and drove back to Summerstrand for breakfast. We bought some smoked salmon, cream cheese and a baguette from the Spar and walked down to the beach for a little picnic. Apart from a few surfers, the beach was deserted! Just beautiful, warm beaches with no one on them! It was incredible. We walked around the boardwalk for a bit, checking out the piers and taking photos of the town, then we packed up and hit the road again. 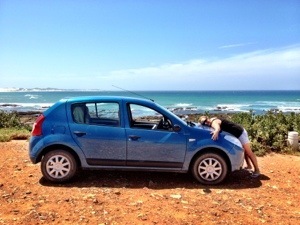 We drove along the water to a place called Sea View and that’s where the beauty of South Africa began to hit us. Bright turquoise water with white caps and rocky shores that were stunning. This was the beginning of what the rest of the South African coastline looked like and we were hooked. Every time Kels and I spotted the water one of us would yell “shut up! Shut up!! Do you SEE that?! Oh my god!” Without fail, for the next 8 days. What we didn’t know, was that sea view was just a little, tiny bit of this. 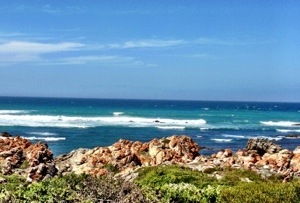 So we continued onwards to Jeffrey’s bay, with lots more spectacular sea views to come. 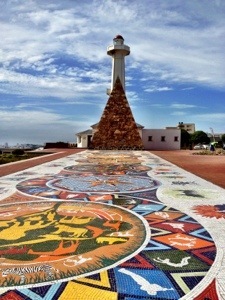 This entry was posted in Africa, South Africa and tagged lighthouse, Port Elizabeth, South Africa coast, Summerstrand, Travel by hilarylust. Bookmark the permalink.